❤ Stylish, Simple, Classy and Personal. ❤ Well made and sturdy. workmanship are very nice. ❤ Creating a lasting and memorable gift. ❤ Really handsome men's jewelry! 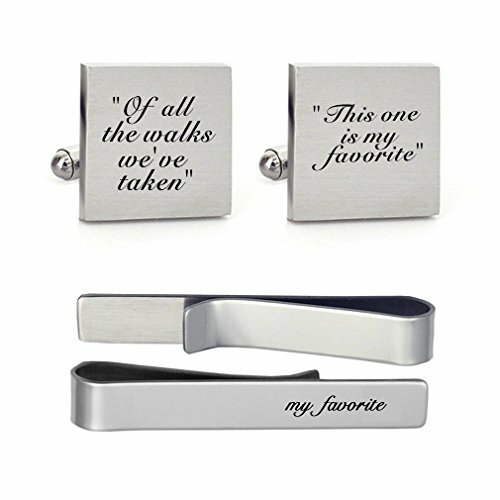 ❤ Personalized design cuff links! to solve any problem . ❶ HIGH QUALITY: Stainless steel material with nice workmanship, It is 19 mm 2 pcs cuff links and tie clip which is very durable and easy to use. ❸ PERSONALIZED JEWELRYS: You can custom a meaningful gift with specific date,intials,name,coordinate,text,logo, Anything what you like. ❹ IDEAL GIFT: The perfect engravable gifts for any occasion: weddings,anniversaries birthdays,meetings,office,speech,formal dinners,ball create a lasting and memorable gift. If you have any questions about this product by MUEEU, contact us by completing and submitting the form below. If you are looking for a specif part number, please include it with your message.